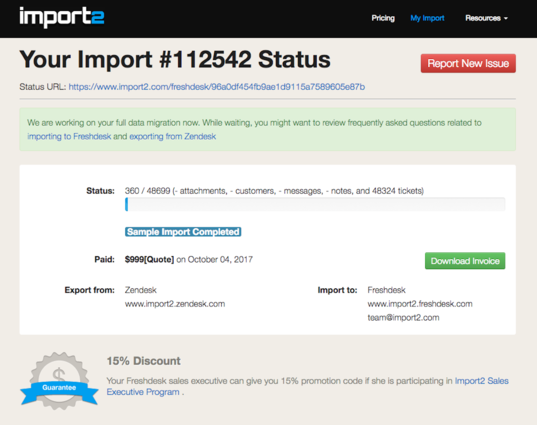 Import2 for Freshdesk is an online helpdesk data migration service. It helps you import all customer support tickets and conversations into Freshdesk from other Helpdesks, such as Desk.com, Kayako, Zendesk and others. Import2 for Freshdesk allows you to import your ticket data into Freshdesk in as little as one-click. We support over 20+ helpdesk export tools, so you can easily connect your old helpdesk and import your historical data into Freshdesk. We provide support throughout the entire process if you have questions, or need to customize your import. If you have any questions on the sample data, or need to customize your import, simply reach out to Import2 and a data migration specialist will work with you throughout the process to ensure your data migration is successful.